Bring your littles to this fun and interactive toddler inspired playgroup. 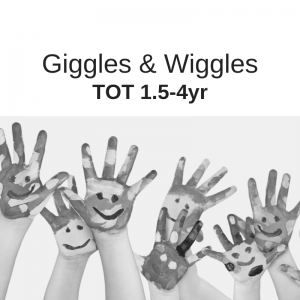 Through organized song, play, and activities you and your toddler will enjoy this safe, upbeat group environment as they get their giggles and wiggles out – and who knows, you might just enjoy some giggles too! Join Kara-Joy Wilson – Barrie Busy Mama – and her kiddos as they lead this 1 hour exclusive playgroup every 2nd and 4th Tuesday of the month! Complimentary Coffee, Tea & Water provided! Let’s work together to cultivate team building skills in a toddler-approved, fun and creative way. Give your little circus performers an opportunity to develop their balancing skills in a toddler safe environment with the security of having you close by. Encourage the development of hands on play and imagination of your little(s) through sensory, yet messy, play, where you don’t have to clean up the mess! Support your child’s spacial awareness development and desire for exploration through a series of fun and enjoyable challenges. We’ll focus on fostering Olympic inspired skills such as throwing and target activities in a fun and creative way.